¡Santa Maria, Madre de Dios! The “devil is on the loose” my people. And I’m not just giving one of my favorite country music singers, Waylon Jennings, a post mortem shout-out. Interesting story before I get going…when my family and I first arrived in California in 1983 from Mexico, we bought ourselves a color television and started tuning into prime-time television. There were a few sitcoms we just loved to see, despite none of us having any idea what was being said on these shows. There was Knight Rider, the show we lovingly called, “El carro que habla”—The car that speaks…sorry David Hasselhoff the show for us was about KITT. There was the A-Team. We referred to this show as, “Los que inventan”—The ones who invent. And of course there were The Dukes of Hazard. We dubbed this show, “El carro que vuela”—The car that flies. I loved and continue to love the theme song, “Good Ol’ Boys,” by Waylon Jennings. 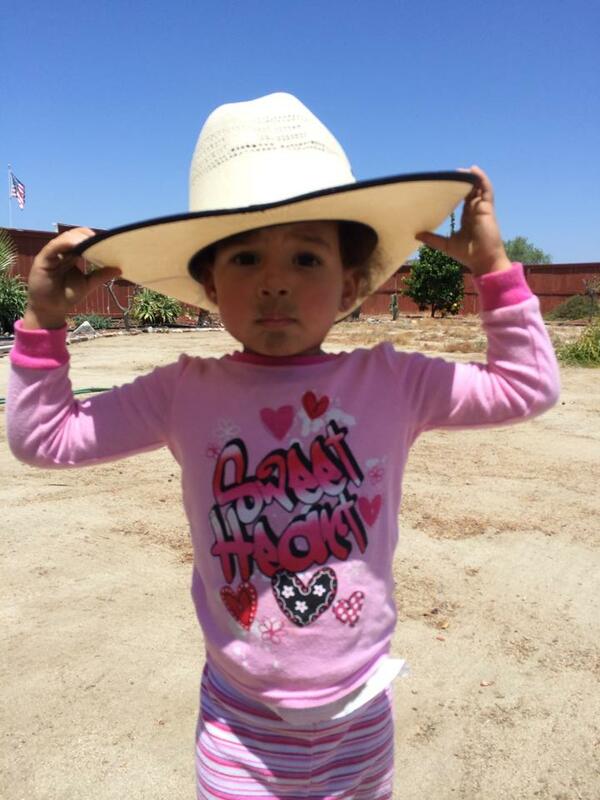 Rehani with my yard work Cowboy Hat on, about a year ago. Alright now let’s get to some business. I have some more critiquing to do and yes, it is similar to my previous post where I put CalSTRS on blast. This time, however, I leave no stone unturned, scrutinizing every state teacher pension system in the nation. If you’re a teacher, I highly recommend you read this post to its entirety and also share it with a peer. If you’re not a teacher, please read this post and share it with a friend who may be a teacher. By the way, unless otherwise noted, the source of this data was from a phenomenal must read report at: http://www.nctq.org/p/publications/docs/nctq_pension_paper.pdf. 41. That’s how many states have unfunded teacher pensions. Now, not all teachers in the U.S. are members of a statewide pension system, but let there be no confusion that it ultimately doesn’t matter. 41 aren’t sufficiently funded (data is from 2012). Here’s where the confusion begins for most teachers. Most teachers couldn’t tell me how their pension benefit at retirement (full teaching career or not) is going to be calculated. I don’t blame them. Some like NY STRS is worse than a mortgage disclosure statement. NY STRS needs handbooks, and interactive videos to educate active members about their Tier 1-6 benefits. Sooo much complexity! But wait, New York leads the nation in charging forward with Common Core State Testing. Oh, and unions are too busy fighting Charters and their employers for kids and salary, respectively. Who cares if the Devil is loose in the NY STRS pension system, right? Another problem: many teachers do not know the difference between a defined benefit and defined contribution pension system. Teachers in 38 states get no choice but to be in the default defined benefit plan. Why as teachers are we okay with this? California, Delaware, Iowa, Nebraska, Tennessee, etc., teachers, are you okay being given just one choice to fund your retirement? How can we stand for most of us being pegged into one retirement funding option as professionals? DB pension plans guarantee a monthly retirement benefit with parameters that exclude the public markets at the individual’s level. This is why unions are in support of them. You will see below that what you will “get” at retirement every month doesn’t depend on your investing performance or the public markets. This is a great thing for (lifers) teachers, the security of knowing that the longer they work and promote, the more they stand to get each month once they leave teaching. The only uncertainty teachers have in a DB pension plan is…not knowing if the system itself is viable or sustainable! Even though teachers aren’t making investing calls with their retirement money, someone else is. Whether it be you or the hired and expensive money managers of your DB pension plan, there is no escaping the impact of the stock market on your retirement money. Like most professionals (85% of the private sector) with 401ks, I’d personally prefer to have investment options. DB pension plans kick the can down the road, burden employer budgets now even more than ever (the highest expense in a school district’s budget is personnel) and new teachers entering the system having to contribute more to make sure retirees get their benefits. In California, I have to be victim of Mr. Ailman and company’s investing decisions, even when I DON'T AGREE WITH THEM! Mr. Ailman, can you please explain to the teachers of CA why we need money managers who in ten years have barely matched their benchmark returns? Without lawmakers passing “reform” laws every other year it seems, tax payers would be in serious jeopardy of having to pay additional state taxes to bail-out DB pension system shortfalls. But there are more maladies that plague the DB pension system. 401ks are portable, meaning I could take what’s in my 401k anywhere in the country, and not be punished for switching jobs. What would happen to my CalSTRS pension today if I moved to, say, Arizona? My pension would freeze at 14 years of “service credit” (a total sham by the way)! My service credit factor would be locked at 14, and my first year of teaching in another state with a TRS Defined Benefit pension plan would be considered year 1 of service credit there. Why does that matter? Because the more service credit, the higher the factor to improve my monthly benefit at retirement. Not fair! Why do we agree to a retirement system that punishes us for mobility? You mean I gotta weigh my family’s needs to move out of state for whatever reason with potential loss in my annual pension amount? Then I arrive in this new state and get punished even more, being dumped into another defined benefit pension system that may have a “multiplier” that varies (perhaps be lower) from the multiplier from the system I left. Rise up teachers in DB plans, rise up! We can agree to a Common Core nationwide, but not a common and transferable DB plan system? It can’t be done? Well, considering that every state generates income differently, and each state pays teachers differently based on cost of living, a transferable DB pension for teachers is probably impossible. What are the alternatives to DB Pension Systems for Teachers? Alaska is seriously bold. Even though the state is frontier land, with incredible temperature changes, and long hours of darkness several months a year, the state switched to a Defined Contribution pension system for all public employees, including teachers, starting in 2006. It was very controversial folks, hampering teacher recruitment immediately. Just look at this 2009 Juneau Empire.com online news article: State should let workers choose between defined benefit or 401(k )plan. It’s been relatively quiet in Alaska since this. I wonder why? Could it be that any new teacher that entered the teaching profession in 2006, and is still working in Alaska today, is delighted by the returns of a stock market rally now almost a decade old? But Carlos, let’s wait to make judgement until a major crash. Like a stock market meltdown won’t impact Defined Benefit plan members indirectly! Ask yourself this better question. Why aren’t 41 statewide defined benefit teacher pension plans in the green after a stock market rally that not only made-up for all of its previous crash’s losses, and then some? Because the fees the pension managers charge the state, and invariably us, add up! Because they are full of corporate bureaucracy that has everyone getting paid handsomely from the bottom all the way up! Kansas and Louisiana teachers can opt-into what’s known as "Cash-Balance" pension plans. These too are controversial. Basically, anything that is new and innovative and not a traditional DB plan is “controversial.” It’s hard to let go of a beaten dead horse. Cash-Balance pension plans are DB plans with DC plan components. They give members a monthly benefit for life; however, one does not know what it will actually be because the monthly benefit will depend on investment performance and amount of contribution. These still don’t give members the ability to manage their own holdings. Like DB plans, Cash-Balance plans are professionally managed. What a stinker! Only 52% of pre-retirement salary replaced after 32 years of service. Anomalies? Well, let’s take a look at how CA teachers are doing after their careers in education. CA Teachers, you stand to have on average a final compensation of $80K and an Unmodified Benefit of $48K after your 25 year career, or a replacement salary rate of 59%. “Established a supplemental retirement savings account? It’s never too early to start saving for your future. The median CalSTRS retirement benefit replaces about 50 percent of a member’s salary. You’ll need to close any gap between your income and your retirement benefit with savings and investments, such as CalSTRS Pension2.” Note: I purposely emboldened that sentence so it sticks in your head. 25% chance of a replacement salary below of $17K i.e. 17K/40K FAS or 43% rate or lower. 25% chance of replacement salary above $40k (the average FAS) or a rate equal to or greater than 100%! 50% chance of matching the median of $26K of the average final salary of $40K for a 65% rate of salary replacement. Roll the dices people because you know quite well that I would prefer the Louisiana Cash-Balance odds any day over the knowns of the New York, Texas, and CA DB pension plans. And if I had a choice, like teachers in 6 states in our union do, I would select a full Defined Contribution pension plan any day of the week and twice on Sunday if I had to. Having their retirement be in a Defined Benefit pension plan has kept many public employees financially illiterate. There’s no need to know how to invest in securities when our pension system does it (poorly) for us. Teachers are no exception. We’re the last to grab the bull by the horns. The private sector started changing to DC plans years ago, and now after years of initial complaining and struggle, owners of 401ks have begun to embrace individual responsibility for their retirement. They’ve taken to improving their financial savvy for their own sake, buying low-cost index funds, or turning to low-cost automated 401k service providers such as Blooom.com. But not educators. Oh no…we, with our unions will resist to the bitter end, until each state is broke and can pay nobody to retire! Subscribe to my blog and get my eBook: Common Core Money: Financial Literacy for Educators & Other Professionals absolutely free. Start reading! Don’t expect there to be anything in the DB pension plan of your state for YOU to retire on. The least you expect of those bureaucrats the better. Use as much of your salary to fund a Roth IRA and invest within the Roth IRA for the love of God. Buy my eBook: The Ultimate Teacher's Guide to Supplemental Income and start side-hustling to put even more into the Roth IRA you open. Don’t waste time searching for things teachers can do to earn supplemental income. Spend $4.99 and get a resource unlike none out there.